The staff of the Spartan Shield wishes you and yours a Happy New Year as we bid farewell to 2018. 2018 was a great year for all things Spartan. From arts and athletics to academics and advances, Pleasant Valley students proved their commitment to excellence all year. The Spartan Shield staff wanted is proud to bring you a highlight of 2018’s biggest moments for Pleasant Valley High School. Please enjoy these Year-in-Review articles and videos of PV news, arts and athletics. From the staff of the Spartan Shield, we wish you all a happy and healthy 2019. The year 2018 has been quite memorable for the students of Pleasant Valley. From beginning to the end, this year was full of many different adventures. With new developments and changes throughout the district, every year is a new experience for PV students. With the year coming to a close, it is time to recap Pleasant Valley’s most memorable triumphs and transformations of 2018. The year started strong academically, especially for four seniors in the class of 2018. 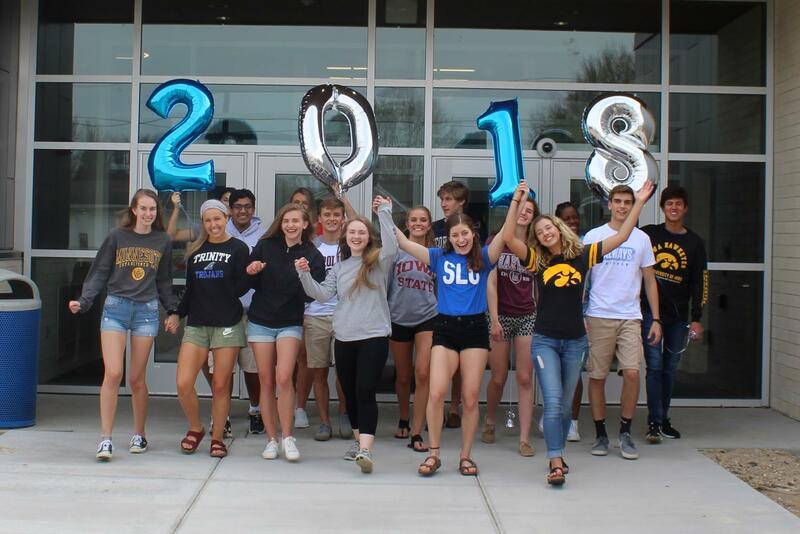 Students Subrat Acharya, Jack Lynn, Sophia Xio and Abby Davison were all exclusively chosen to receive Presidential Scholarships for the University of Iowa. This scholarship provided each student with up to $20,000 and is renewable each year until the student graduates with their bachelors degree. This scholarship was not easy to obtain, it requires a GPA of at least 3.8 and an ACT score of 33, so these four students had to fight with thousands of applicants for one of the 43 spots. The class of 2019 also represented Pleasant Valley academics well at the 2018 IHSPA conference in Iowa City. At the conference, students were given the opportunity to listen to the keynote speaker Brian Ross and take workshops throughout the day. One of the workshop options was to enter a writing competition. This writing competition was the IHSPA On-The-Spot News Writing Contest, where each contestant was given 40 minutes to write a news article about the Keynote speaker. Senior Lily Williams ended up being this years winner. Not only was PV recognized for its academic success, but for students taking a stand for what they believe in. On April 20, over 250 PV students participated in a school walkout to take a stand against gun violence, school shootings and to show support for the #NEVERAGAINQC movement. For a full hour and a half, students had moments of silence and speeches by many different students over many different topics. Pleasant Valley’s Sparkles also met a milestone this past October. Created by Sarah Cronk in 2008, the Sparkles is an inclusive cheer team that has now been successfully changing lives for 10 years. The program has had years of success in spreading their message and the Sparkles have become a sign of hope for all. Big changes regarding school administration were also announced in 2018. After 15 years of being Pleasant Valley’s Superintendent, Dr. Jim Spelhaug announced his retirement following the end of this school year. Succeeding Spelhaug will be the current assistant superintendent, Brian Strusz. With the new change, students, staff and parents are eager to see what will come in the future. After 22 years of previous work experience at Pleasant Valley, Strusz is ready to further his career as the district’s new superintendent. Not only is the administration changing, but the building has seen many changes in 2018, too. It has been a long time coming but the new additions are finally finished. Beginning with the new commons that were completed back in 2017, the construction was finally completed with the new tower and gym this year. The new tower is three levels tall and stocked with new lockers, classrooms and tons of natural light. Along with the tower there was a new gym with an elevated track, a new cardio room and a new addition to the lifting room. After all of the new developments and memories made in the year 2018, there are big hopes for the years to come. Looking back at 2018, there have been many outstanding moments for Arts and Entertainment from the Spartan Shield. To start off the year, PV students competed in eleven different events for the District Large Group Speech. With the inspiration of the PV students participating, seven of these events advanced to the State Large Group Speech. Students were practicing from the beginning of the school year to perfect their performances. Those who did not make it were obviously disappointed, but instead of giving up they decided to keep a positive attitude and and turn this into a learning experience they can use to succeed in the future. In February, the improv team WACIT, consisted of Odin Mcdonald, Olivia Peters, Molly Dippel, and Kaylynne Nowak. While performing at districts and state, they successfully earned a division one rating, which is the highest rating in the speech competitions. Due to their variety and diligence in practicing performance, WACIT qualifies for all-state speech competition. Also, the second performance of the year for both Concert Band and Wind Ensemble came. This was the time for students to show their improvement in band from the beginning of the year. Along with the band, the Wind Symphony and Dr. Elizabeth Matera, an amazing clarinetist in the President’s Marine band. As a member of the band for 27 years, she had played for five presidents. As spring came around, Leading Tones participated in the Iowa Vocal Jazz Championships. It was their tenth year in a row at the championships. On the same day, six students auditioned for Iowa All-state Jazz Choir. They prepared to sing three scales, a prepared audition cut, a memorized solo and sight reading. In the annual Senior Band Concert, the Wind Symphony featured three of their best musicians. The first was Claire Thompsen, the winner of the 2017 quad city Youth Symphony Concerto Competition, who played a flute solo. The other two musicians were Ethan Good and Keshav Wagle, who performed a duet accompanied by the Wind Symphony Band. As the school year transitioned to April, the drama department acted out the show Scapino!, which is a modern version of an italian play. The cast was working on the show since the beginning of of March, and it was thoroughly enjoyed by the audience. At District Band Night, both the sixth grade through high school bands performed songs that they had practiced during the school year. The sixth graders were able to play as one large group, which gave them a chance to experience what band was like for their next year. This was also the second time this concert was hosted in the Taxslayer Center. The music department took part in the Iowa State Solo and Ensemble Festival. Pleasant Valley had 100 entries in the states band contests, and overall, the PV Vocalists received more “Best of Center” awards for for six out of seven local centers. During the month of May, most of the spartan musicians performed at the State Large Group Festival. The outcome of rehearsing for months, and perfecting their performance, ten of the ensembles got the highest scores, Division I. The other two events earned the second highest scores, Division II. This was also the month of the PV Orchestra Program, which is the time for seniors to enjoy their last performance. Since this can become emotional for the seniors the director, Rod Swinney annually gave each graduate a self-made caricature. This year Swinney was surprised with a caricature of his own, presented by the grateful seniors. Pleasant Valley ended the 2017-2018 school year with the senior Choir concert. The Senior Choir members’ final performance, included filling the stage, and overflowing into the aisles to sing “A Million Dreams” from The Greatest Showman. To begin the 2018-2019 school year, dedicated musicians had started practicing for All-State Auditions in early July. Many of the participants in this event attended the Meistersinger All-State Camp at Wartburg College to practice their music. Marching Band also started practicing their skills during the summer. This also helped the incoming freshman practice marching in the field while playing their instruments. Some students in band wanted to participate in drumline spent their summer to go to the Cyclone Percussion Academy. They spent their time practicing and perfecting cadences to be ready for the football season and school assembles. In the month of October, the improv teams put together a show for the annual improv night. Along with Hatrick and WACIT, a new group called Kakistocracy was created. After an enjoyable performance this fall, Hatrick was announced the winner. This month was also Senior Night for the Marching Band. Since this was the last time seniors performed in marching band, they performed in halloween costumes while the underclassmen wore their uniforms. Along with the chance to dress up, the seniors planned out the drills and the music. Even though these students had only one week to prepare, they had a great time performing. At the close of 2018, the drama department put together the one-act children’s play, “The Lion, the Witch, and the Wardrobe.” This happens every year, but this year was unique because they decided to travel to several children’s hospitals in the area to spread happiness and hope to the kids who needed it. As Pleasant Valley is wrapping up the year 2018, we are eager to see what 2019 has in store for our talented art students. The Spartans began 2018 with an unforgettable basketball season. The hardworking and talented individuals on the boys and girls teams earned themselves MAC championships. Additionally, a number of players were recognized for their skills. Kira Arthofer and Ellie Spelhaug were both 1st team All-Metro and Spelhaug was 1st team All-State. Spelhaug was the MAC girls basketball player of the year and coach Goetz was the coach of the year. Arthofer chose to continue her academic and basketball career at Eastern Illinois University and Spelhaug at Bradley University. For the boys, Brian Dayman and Hunter Snyder were both 1st team All-MAC. Dayman committed to play division two basketball at Southwest Minnesota State University. The few stand-out wrestlers had an amazing season. Justin Harrington was 2nd Team All-Conference and Eli Loyd was 1st team All-Conference. Sophomore Eli Loyd brought in his 100th career win and was the state runner-up in his weight class. The boys swim team broke the 200 medley relay record. Kevin Burke placed 2nd in the 50m race, breaking the school record. Burke committed to swim for division one college IUPUI. The Platinum dance team performed at state dance and placed 2nd in both pom and jazz routines, and Amy Showers was one of six dancers awarded the ISDTA scholarship. The Spartans kicked off the spring season with a MAC championship in boys soccer. This knocked Bett off the 23 year MAC win streak—a huge accomplishment for Pleasant Valley. Anthony Pena was awarded 1st team All-Area. The girls had a great season as well. They were tri MAC champs and Grace Necker and Jenna Ruccolo were 1st team All-Area. Pleasant Valley had a killer 2018 track season. Both the boys and girls teams had a number of relays and individuals qualify and place at Drake Relays and State Track. Arthur Braden, Parker Huhn, Konnor Sommer and Sam Hanna were 1st team All-Metro for the boys. Arthofer, Amaria Kirby, Abby Riley, Mallory Lafever, Spelhaug, Harmony Creasy and Sara Hoskins were 1st team All-Metro for the girls. At state track, senior Konnor Sommer received 1st place in the 3200 meter race. Junior Adrea Arthofer, senior Kira Arthofer, senior Amaria Kirby and freshman Harmony Creasy won the 4×200 meter relay. The 2018 tennis season was astounding. The girls and boys tennis teams were both MAC champions. One male and one female also showcased their skills playing singles. For the third year in a row, Lilly Feldman was a MAC champion in girls singles. Justin Selhin earned his first MAC championship in singles as well. Over the summer, the lady Spartans won their second consecutive state championship in softball. The team was placed under excellent leadership, including captains Ellie Spelhaug and Alexia Lara. Their record was 36-7. Carli Spelhaug, Ellie Spelhaug and Alexia Lara were first team all state. Carli Spelhaug has committed to Iowa State University to continue playing softball. The Baseball team had some fantastic individual players who will continue baseball at the collegiate level. Senior Evan Crawford committed to the Missouri University of Science and Technology. Kyle Stoddard committed to play at Blackhawk college and Will Christophersen at Michigan State University. Evan Crawford was 1st team All-Metro. Ely Adams, Carter Hoskins, Kyle Stoddard and Jack Young were All-Metro Honorable Mention. This fall, the boys and girls cross country teams were MAC and district champs. The girls went on to place 6th at state, the boys 4th. A vast majority of the male and female varsity runners will continue running cross country at colleges across the Midwest. Ian Kaffenberger, Max Murphy, Kent Nichols and Gavin Smith were 1st team All-Metro for boys. Mallory Lafever, Maddy Minard and Abby Riley were also 1st team All-Metro. The girls swim team had a number of individual and relay events place at the regional and state levels. Additionally, Taylor Buhr and Libby Staver were selected as 1st team All-Metro. Staver committed to swim at the division one level at the University of Wyoming. The boys golf team were MAC champs and placed 2nd at state. The Varsity football team put their heart and soul into the game this year. Seniors Slavens, Max O’Brien and Evan Kilstrom were selected as 1st team All-Metro and 2nd team All-State. The volleyball team had a 26-8 season, earning them the title of co MAC champions with Assumption. They won the Western Dubuque Invitational and were runner-ups at the Waterloo West Invitational. Their season ended with an intense game in the regional finals. Junior Erica Brohm was 1st team All-Conference, 1st team All-Metro, All-District team and Honorable Mention All-State. Senior Adrea Arthofer was Honorable Mention All-Conference and IA vs IL senior game Honorable Mention. Junior Claire Bebow was Honorable Mention All-Conference and All-Metro. Freshman Kora Ruff was 2nd team All-Conference and All-Metro. Sophomore Wood was 2nd team All-Conference and Honorable Mention All-Metro. The Spartans truly put their blood, sweat and tears into every practice and game in 2018. Each and every team lives up the expectation of total effort. 2018 was a year of school records and endless MAC championships and Pleasant Valley will only improve in 2019.